Decorative Marlingspike Seamanship rendered in precious metal. See the workshop and show tour schedule. Find tools and instructions for making your own. 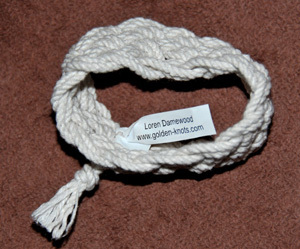 My name is Loren Damewood, and I am a professional knot tyer. 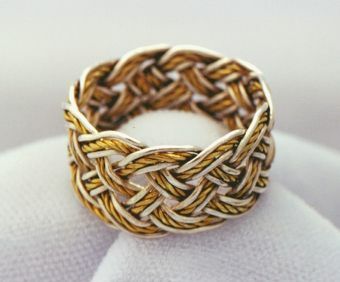 For over thirty-six years (since 1980), I have been creating wedding rings, bracelets and other jewelry by tying silver and gold into intricate and beautiful knots. If you've arrived at this website because of encountering one of my hand-tied bracelets, as shown at the left, you may read more about them, but I hope that you will find my work intriguing and explore further. You may also check out a Facebook page devoted to bracelets that are observed "in the wild". I also have an Etsy shop, and will be adding more to it. The first piece of jewelry I'd like to show you, below: a silver and twisted gold wedding ring. There is a story behind this one, if you'll bear with me. It was the very first ring that was tied with a real expectation of it being a specific size. Original method was pure guesswork. Bad guesses, usually. In the early nineties (yes, it took me ten years!) I awoke in the middle of the night to a realization that I could calculate elements of a ring's dimensions using Pythagoras' Theorem. (If you're interested, see this page.) I made this ring and it fit me! A co-worker bought it, insisting that he didn't care that the pure gold and pure silver "wouldn't last a year", as I informed him, due to the softness of the metal. Six years later, he brought it back for a very minor repair, and I took this picture after fixing it. I use this image on my regular business cards. I tie knots in materials ranging from simple cotton twine to stainless steel wire, but my favorite is pure silver, the whitest and brightest of the precious metals. Most people order gold for their wedding rings, and I generally use 18K in various colors. The above may be negotiable, depending on my travel arrangements, as I am happy to conduct workshops along the way while traveling to conventions and other commitments. I spend a lot of time on the road, and will gladly visit any location with enough confirmed students to finance the journey. A stop that doesn't take me out of my planned route by more than a few hours has no minimum number of students, but the larger that diversion gets, the more students I'd like to see there, up to a maximum of nine.